Male Indigo Buntings begin to appear in the region. Woodpeckers are establishing their nesting territories by drumming. Male skunks wander widely, searching for mates. Roadside 'weeds' (e.g. Speedwell, Purple Dead-nettle, Storksbill) bloom before most native wildflowers. March is a great month for watching waterfowl. Purple Martins return by the middle of the month; be sure to have your houses ready. Woodcocks are doing courtship flights. 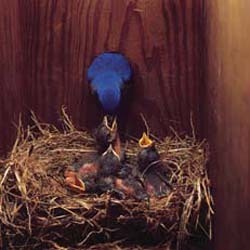 Bluebirds begin nesting by the end of the month. Goldfinches begin to molt into their brilliant yellow plumage.